due to a limited supply of the gemstone. Sugilite is mined near Northern Cape Province of South Africa and due to unrest in the region little to no Sugilite is being taken out of the mines any longer. Durango Silver Company has a large supply of Sugilite that we secured several years ago, we cut and inlay all of our own Sugilite into beautiful one of a kind Sugilite Jewelry. Handcrafted Sugilite Jewelry made in the USA! Most of the Sugilite Jewelry made at Durango Silver Company is in Sterling Silver, however, we are happy to make Gold Sugilite Jewelry as well. 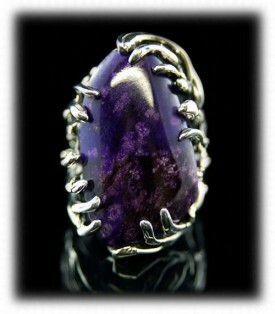 We do stock both Silver and Gold Sugilite Jewelry on our site and we add additional pieces often. If you like Sugilite and are interested in Sugilite Jewelry make certain you visit our site often as we love this beautiful gemstone and we use a lot of Sugilite in our Jewelry. Below are several examples of the Sugilite Jewelry we produce here at Durango Silver Co. We have been well known globally for producing some of the best natural Turquoise Jewelry in the world. 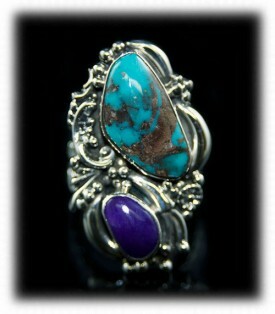 Now, we have been producing a lot of Turquoise Jewelry accented with Sugilite which makes a beautiful color combination. The Sugilite Rings to the left was made by John Hartman of Durango Silver Company in his own Victorian style Silver work. 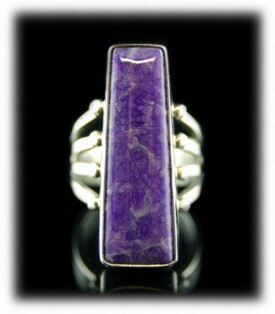 The is an exciting and flashy three stone Sugilite Ring and a beautiful piece of Sugilite Jewelry. The Sugilite Ring on the right was made by Crystal Hartman of Durango, Co USA and was made in the lost wax style where she used molten wax to build layer after layer of wax to create the design, then used the lost wax method to cast the Ring. 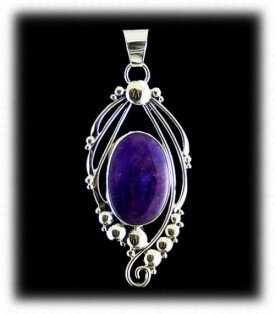 This style of Sugilite jewelry is unique to Durango Silver Company. 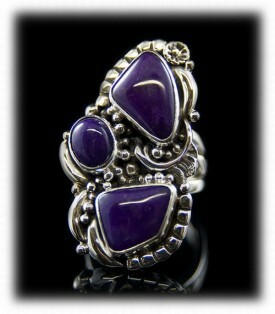 Here are a couple of Sterling Silver Rings with a combination of gemstones along with Sugilite. The Ring on the left has Sugilite, Sleeping Beauty Turquoise and Carico Lake Turquoise Stones set in a Victorian Silver design by John Hartman. This is definately a unique piece of Sugilite Jewelry. The Sugilite Ring on the right features a Bisbee Turquoise stone and a Sugilite stone set in a Victorian Silver design by John. Sugilite Rings of this type can only be purchased through Durango Silver Co. All of our Sugilite Jewelry has natural authentic Sugilite gemstones and is handcrafted in Sterling Silver of Gold. The above Sugilite Rings were produced by Durango Silver Company and are 100% American Made as is the rest of our Sugilite Jewelry! In searching for Sugilite Rings on the Internet we find a lot of fake Sugilite and it looks like most is coming out of China and the Philippines. 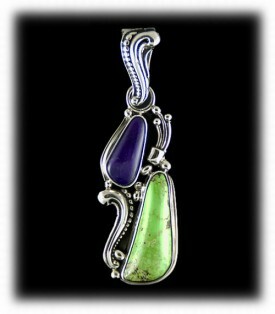 Durango Silver Company only produces high quality Sugilite Jewelry set with authentic Sugilite from South Africa. The Sugilite Ring on the left has a single Sugilite stone bezel set with a four prong Ring shank. The Mens Sugilite Ring on the right is an inlay Sugilite Ring. 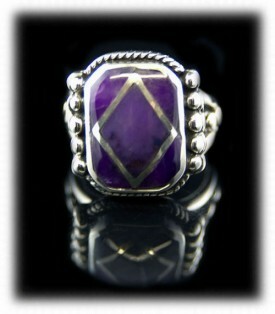 We make the Ring with channels or voids and then we inlay the Sugilite into the voids. Inlay Rings are nice as they are very smooth and work well for people the tend to get Rings caught up while working. Sugilite Jewelry by Durango Silver Company is truly unusual from all other Sugilite Jewelry you may find on the Internet and it is Made in the USA. Here are two Sugilite Pendants produced by our company. The Pendant on the left has a beautiful triangular Sugilite stone accented by three Gaspeite stones which makes this a colorful piece of artistic Sugilite Jewelry. The Sugilite Pendant on the right was produced by Durango Silver Co and Navajo handcrafted. It features a beautiful Sugilite stone with a filigree wire design - made by Verdy Jake. 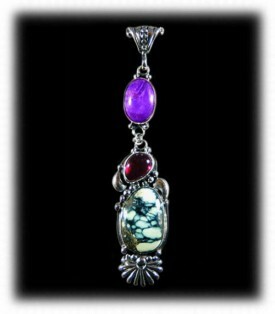 Both of these Sugilite Pendants are one of a kind and will not be duplicated. Above are two unique Sugilite Pendants produced by Durango Silver Co. The Pendant on the left features a Sugilite stone on top, a Burmese Ruby in the center and a Tortoise Turquoise stone on the bottom. This beautiful Pendant has very nice Silver work and is also very attractive in person. 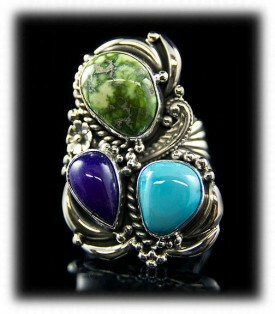 The Tortoise Turquoise stone has outstanding spider web matrix which is coveted by Turquoise collectors. The Sugilite Pendant on the right focuses on the Sugilite Gemstone as it had fine bezel work in 14ky Gold and is cut out on the reverse side for metaphysical purposes - Sugilite is a Spiritual healing gemstone! Sugilite Necklace produced by Durango Silver Company are unique and handcrafted in the USA! Here are two unique Sugilite Necklaces produce by Durango Silver Company and both are American made pieces of Sugilite Jewelry. 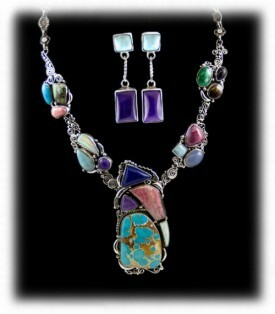 The Necklace set on the left is a colorful Sugilite Necklace accented with Turquoise, Rhodocrosite, Malachite, White Buffalo Turquoise and Lapis. It is certainly a one of a kind Sugilite Necklace that will never be duplicated. The Sugilite Necklace on the right is a unique Necklace in Sugilite and Rhodocrosite beads. 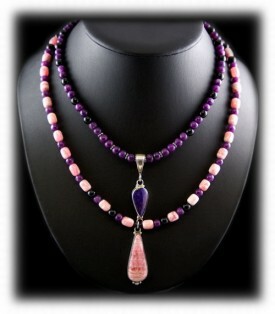 Sugilite is a Spiritual healers gemstone and this Sugilite Necklace features round Sugilite beads which healers love. Sugilite in Bracelets is beautiful. 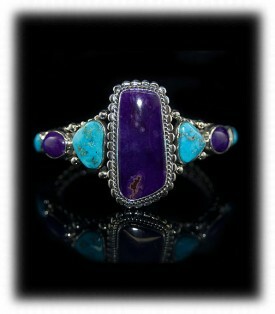 As well as Sugilite Jewelry, Durango Silver Co uses a lot of Sugilite to accent our Turquoise Jewelry as well. The Sugilite Bracelet on the left is of a classic Southwestern style of Silver Jewelry. 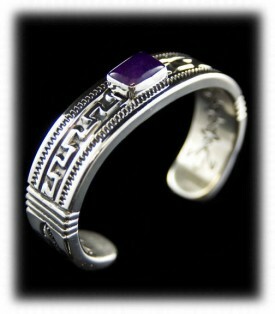 This Bracelet features a Sugilite gemstone accented by 3-D Silver work in a Southwestern design. The Turquoise and Sugilite Bracelet on the Right is very unusual! It was made by John Hartman of Durango Silver Co by applying layer upon layer of molten Jewelers wax to build up the freeform design. The design is totally formed around the gemstones and cannot ever be duplicated. The Sugilite Bracelet on the left was Navajo handcrafted and produced by Durango Silver Company. This piece of Sugilite Jewelry was American handmade as is all of our Sugilite Jewelry. This is a very thick and heavily stamped Sugilite Bracelet featuring a beautiful purple Sugilite gemstone centerpiece. The Sterling Silver is actually about 1/8" thick which has been very popular with many Southwestern Silver Jewelry collectors. The Royston Turquoise and Sugilite Bracelet on the right is a truly piece of Art made by John Hartman of Durango Silver Company. John is a master Silver and Gold Smith that known worldwide for his work. His work has been well publicized in magazines, museums and in the collections of well known noted individuals. This Sugilite Bracelet is a good example of his Victorian Silver work. The Sterling Silver Sugilite Bracelet on the right is what we call a Row Bracelet that is a classic in Southwestern Silver Jewelry and is unique in Sugilite Jewelry. 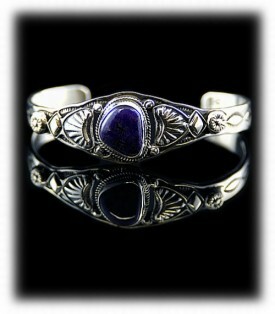 It features a large Sugilite gemstone centerpiece that has nicely tooled Silver work surrounding the gemstone. To both sides of the center stone are natural high quality Morenci Turquoise gems that have been in the Hartman collection for nearly forty years. 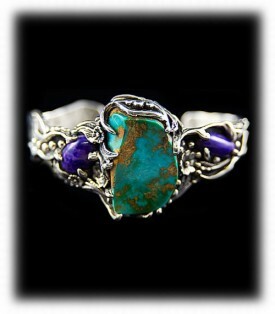 Natural American Turquoise is becoming very scarce and highly collectible. Actually, natural Turquoise is becoming extremely scarce worldwide! Sugilite is also scarce as it is no longer being mined due to unrest in South Africa. The Sugilite Bracelet on the right was Navajo made with overlays of Sterling Silver in a geometric design and is a wonderful Sugilite jewelry. 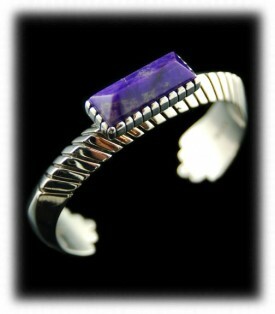 It is a freeform bracelet that features a Sugilite and Turquoise inlay into a uniquely crafted bezel. 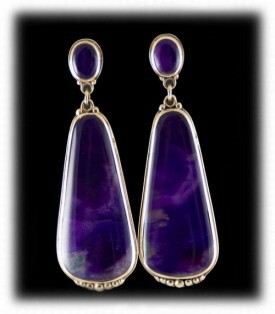 Sugilite Earrings are beautifully attractive when worn and women adore them! The pair of Sugilite Earrings on the left focus heavily on the Sugilite Gemstones as they are simply set in a bezel design with delicate yet classy Silver accents. 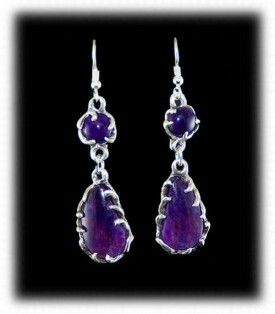 These Sugilite Earrings have extra large stones that are of gel quality and almost see through. This is a wonderful example of highgrade Sugilite Jewelry. The Rhodocrosite and Sugilite Earrings on the right are also unique as they are one of a kind and will not be duplicated. They are a great shape and uniquely shaped Earrings are attractive when worn. 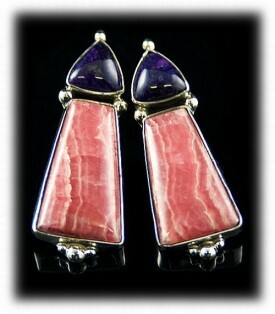 These earrings are great examples of Sugilite Jewelry. The Sugilite Earrings on the left were made by Nattarika Hartman of Durango Silver Company. They were made by applying layer upon layer of wax around the Sugilite Gemstones to create this unique design. 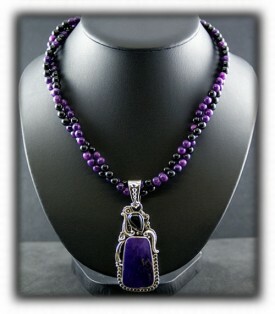 This style of Sugilite Jewelry are wonderful examples of one-of-a-kind Sugilite Jewelry. 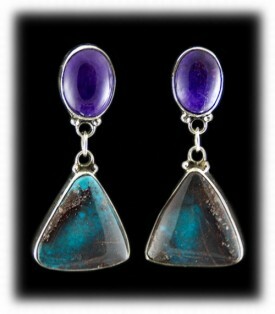 The pair of Sugilite and Bisbee Turquoise Earrings on the right are a collectors dream. 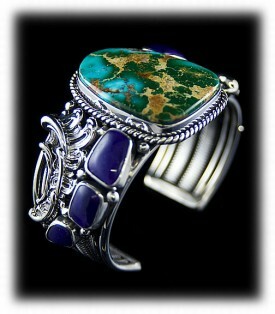 Bisbee Turquoise is very rare and celebrated as the most Spiritual Turquoise on earth for its unusual mineral content. They are paired with Sugilite Gemstones which are highly sought after by Spiritual healers worldwide. Sugilite combined with Turquoise creates beautiful metaphysical Jewelry. Durango Silver Company had the good fortune of landing a major collection of high quality rough Sugilite many years ago when Sugilite was still being mined in South Africa. As crime and unrest in Africa has caused the mining of Sugilite, as well as many other gemstones, to come to a halt, it has become scarce and rare in the world marketplace. Sugilite is a beautiful gemstone that is sought after by healers of the world for its metaphysical powers as well as collectors that love it for its beautiful purple color's. We assure and guarantee you that the Sugilite we use in our Jewelry is real, natural and of high quality. We love Sugilite ourselves and enjoy incorporating it in our Southwestern Jewelry, so, if you admire Sugilite visit our site often to see new Sugilite Jewelry items we add to our site weekly. We hope you have enjoyed our presentation on SUGILITE JEWELRY and have gained some useful knowledge from it. We invite you to learn more about Turquoise and Turquoise Jewelry by following the links in our Learning Center to other informational pages that we have written on different topics related to Turquoise Jewelry. In addition, we would like to invite you to join our E-Mail Newsletter - about once every other month we send out a Newsletter to inform our members of what's happening with Durango Silver Company, new products, specials for our members and more. We also have a monthly drawing from our member base to give away free Turquoise Jewelry from our company. Please take a moment to become one of our friends by signing in below. Thank you for reading about Sugilite Jewelry.